The last few weeks have been quite big for fans of DC's Legends of Tomorrow. Last week's episode was their Old Man Arrow crossover, where it was revealed that Connor Hawke is actually the son of David Ramsey's Diggle. This week's episode Night of the Hawk revealed an intriguing Smallville Easter Egg, and earlier today, The CW announced that the show has been renewed for a second season. While we get ready for next week's episode, Left Behind, The CW has released a new sizzle reel, featuring all of these heroes coming together to try and stop Vandal Savage (Casper Crump). Last month, the show's Instagram revealed imaging teasing the debut of Jonah Hex (Johnathon Schaech), along with a number of other DC Comics characters who have yet to be cast such as Ma Hunkel, the Golden Age version of Red Tornado, Hourman, Sandman and Sgt. Rock. These characters are all said to be appearing on the show at some point this season, but with just five episodes left, it isn't clear when they will make their debut. It's possible that they may show up in the season finale, which could lead into next season. Back in November, a report surfaced that Matt Ryan was being eyed to join the DC's Legends of Tomorrow cast in Season 2 as John Constantine. This report claimed that the show will feature a rotating cast of characters each season, but that hasn't been confirmed by the network quite yet. It's possible that the season finale could set up this rotating cast, and now that we know a second season has been ordered, perhaps the network will confirm these rumors about the cast. DC's Legends of Tomorrow stars Victor Garber as Dr. Martin Stein, Brandon Routh as Atom, Arthur Darvill as Rip Hunter, Caity Lotz as White Canary, Ciara Renee as Hawkgirl, Falk Hentschel as Hawkman and Franz Drameh as Jay Jackson, with Dominic Purcell as Heat Wave and Wentworth Miller as Captain Cold. Based on the characters from DC Comics, DC's Legends of Tomorrow is from Bonanza Productions Inc. in association with Berlanti Productions and Warner Bros. Television, with executive producers Greg Berlanti, Marc Guggenheim, Andrew Kreisberg, Phil Klemmer, Chris Fedak and Sarah Schechter serve as executive producers. Take a look at this sizzle reel below, and stay tuned for more on DC's Legends of Tomorrow. 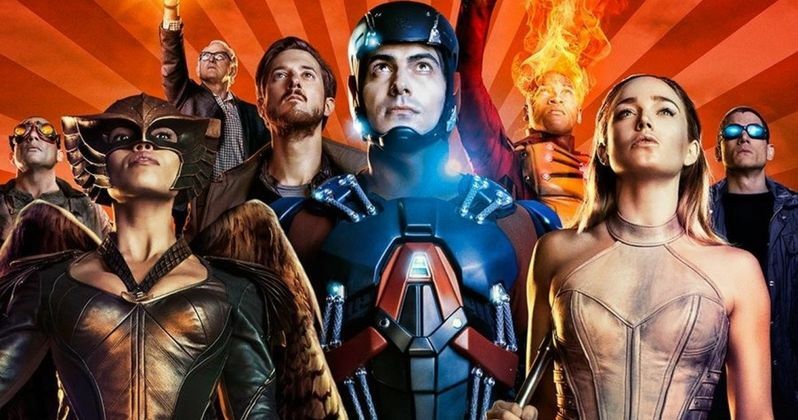 Legends of Tomorrow Finale to Introduce a Major DC Comics Character?